Josie And The Pussycats #8 Review: Guest-Starring The Archies! 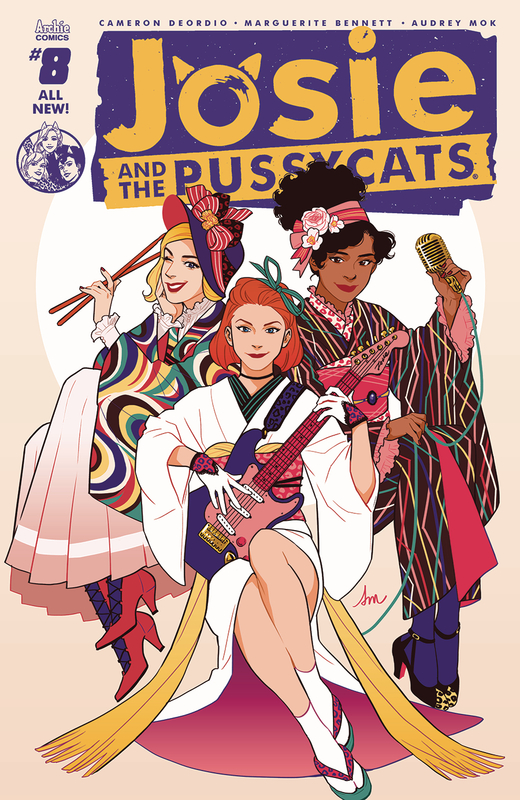 The newest issue of Josie And The Pussycats shows just how the creative team has gloriously reinvented the characters. The original series had a very similar style to the main Archie comics, to put it charitably. Even before the band was integrated in 1969, the series generally featured the same 'wacky teens' stories, right down to the love triangle. Even when the band officially began, it also stuck with the love triangle and slowly phased out some of the weirder aspects. For example, Alexandra had magical powers. If you don't count the temporary manga-influenced run in the back of Archie & Friends, then the "New Riverdale" imprint acts as the first drastically different interpretation of the characters. The foundation still exists, but the creative team puts a new spin on the characters and plots. Cameron and Marguerite have taken various aspects of the franchise from the original comics, the 2001 film, and even the various animated series and distilled them into a series that feels both familiar and brand new. It's the DC Rebirth of the "New Riverdale" universe in that way. Just like the series itself, the title characters also have a more mature feel to them. They're no longer in the same vague high school age as the Archie crew, instead being somewhere in or post-college. I like seeing the Pussycats act as mentors to them. It allows the reader to see how they mesh as characters, both in terms of similarities and differences. In fact, my only real issue with the comic would be the revelation that it's the penultimate installment of the comic. To be fair, I knew that it hadn't been seen in the solicitations, but the Archie Comics, Inc. series have gone on hiatus before. Maybe I should have been clued in based on the solicitation's mention of a finale, but the wording was just ambiguous enough to make me believe that it was an ending for the current arc. Josie And The Pussycats #8 is written by Cameron DeOrdio and Marguerite Bennett, drawn by Audrey Mok and Kelsey Shannon, colored by Kelly Fitzpatrick and Matt Herms, and lettered by Jack Morelli. You can find it at your local comic book shop.